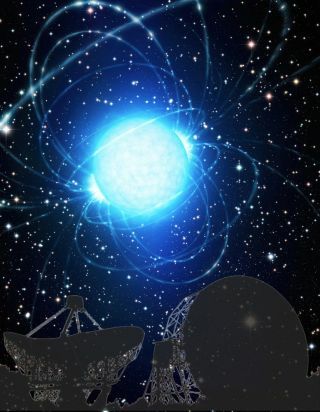 An artist's rendition of a pulsar, which radiates bright beams of light from its two magnetic poles. The pulsar doesn't necessarily rotate around those poles, so the beams of light sweep across the sky and sometimes appear to "pulse" on and off. This image portrays the Jodrell Bank Observatory (silhouetted in the foreground), where scientists are studying pulsars, which are formed through exploding stars called supernovas. Pulsars, the left-over remains of exploded stars, are considered some of the most accurate natural timekeepers in the universe, but even these excellent cosmic clocks aren't perfect. A new study suggests that pulsars occasionally exhibit a "glitch" in their timing because they are filled with a "superfluid" that can flow over any surface without friction. When massive stars grow old and die, they explode, sometimes leaving behind a neutron star — a small, incredibly dense nugget of collapsed, leftover star material. A pulsar is a special type of neutron star that spins at hundreds of revolutions per second. Pulsars also emit a steady beam of light, often as radio waves, which may sweep across the Earth, creating the illusion that the pulsar is blinking on and off. The timing of this blinking is so regular that pulsars are among the most accurate timekeepers in the universe. Pulsars form when a star with a mass anywhere from one and a half to three times that of the sun runs out of hydrogen fuel and collapses under its own weight. The collapse fuses the outer layers of the star's core star and creates an explosion — a supernova. But much of the star's mass remains. The atoms themselves are crushed, and the electrons (which typically orbit the atom's central nucleus) either collide with protons (turning them into neutrons), or escape. What's left is a ball of neutrons, surrounded by a crust of neutrons and protons. Neutron stars are less than 10 miles (16 kilometers) across but are so dense that a teaspoon of its substance would weigh hundreds of times as much as the Egyptian pyramids. When rotating objects (like stars) collapse, they speed up (think of an ice-skater pulling in her arms to spin faster). That's why pulsars spin so fast — stars have a lot of mass and start out millions of miles across. Neutron stars, including pulsars, have intense magnetic fields that beam radio waves out into space along their two poles. Because these poles don't always line up with the pulsar's rotational axis, the radio waves are like the beams of a lighthouse, moving across the sky as the pulsar spins. When astronomers see the beam with a radio telescope, the signal appears to pulse on and off. Pulsars rotate at very regular intervals, only slowing down by about 1 second every million years, on average (hence why they are known as cosmic time keepers). They slow down because they lose energy through radio waves and particles emitted from the surface. So scientists can't explain why pulsars occasionally "glitch" or speed up, but the angular momentum to make this happen must come from somewhere. That's where the idea of superfluids comes in. Most astronomers think the crust of a neutron star is like a rigid crystal lattice, but below the surface, the increasing pressure would make the material more and more malleable, until it becomes a fluid. In the new study, Wynn Ho, a lecturer in mathematical sciences at the University of Southampton in England, and his colleagues say the fluid is a superfluid, and can store angular momentum because it has zero viscosity. A fluid's viscosity is similar to its thickness, so water has a much lower viscosity than honey. "If you have a cup of water on a table and spin the cup, the water will spin up," Ho told Space.com. "The cup will slow down because of friction from the table, but the water will keep going." Ordinary water will eventually stop as it gives up energy to the cup via friction, but superfluid water wouldn't, he added. This image portrays the Jodrell Bank Observatory (silhouetted in the foreground), where scientists are studying pulsars, which are formed through exploding stars called supernovas. In the background of the image is the Vela supernova remnant. Although other scientists have proposed that superfluids might exist at the center of neutron stars, the new model adds the physics of vortices and the role of temperature, Ho said. The immense pressures inside neutron stars create temperatures of billions of degrees. However, those scorching temperatures still drop over time, and when they go below a critical point, it's possible to have a superfluid, Ho said. "We found that there's a direct correlation between temperature, how much of the pulsar is superfluid and the strength of glitches," he said. Ho said his team's model seems to match up with many years of observations of pulsars better than previous models do. But to be sure, he wants to observe a pulsar as it experiences a glitch, to see if the predictions match those observations. In fact, one pulsar is being observed just for that. "We want to watch it glitch a couple of more times," Ho said. Another twist is that this phenomenon can be used to measure the mass of the pulsar. "The new 'spin' (no pun intended) of the paper is that, apparently, the authors have found a mechanism to measure neutron-star masses from the study of pulsar glitches," Jorge Piekarewicz, a professor of physics at Florida State University who also studies the dynamics of neutron stars, said in an email to Space.com. Piekarewicz was not involved in the new study. "Although many techniques are in place to measure masses, the suggestion by the authors of using pulsar glitches is certainly interesting," he said. Usually, to determine the mass of a pulsar, astronomers look at a companion star and estimate the mass from how the two bodies influence each other's motion (the more massive the object, the more it will pull on a nearby companion). "Because of the kind of model we have, we can determine [the] mass of the pulsar… determining the mass from the nuclear physics we know, and not measuring mass from gravity," Ho said. Coupling that with a more conventional mass measurement would be a boost, he added. "If the pulsar is in a binary," he said, "[we] can determine its mass [from gravity], and see if the mass that we predict [with the new model] is the same."